Ah, the holidays are here, and that comes along with many of my own favourite activities and community traditions: Christmas lights, caroling, picking out and decorating the perfect tree. Then there is the food! Dinners, get-togethers with family and friends and grandma’s ginger and oatmeal cookies also come to mind. But there is one much-loved tradition here that sneaks up on us: the Polar Bear Swim on New Year’s Day at White Rock beach. The event began as a spontaneous challenge between friends at a New Year’s Eve party in 1970 and kicked-off what is now a much anticipated annual tradition. Then on January 1st, 1971, Rod Kerr, Clare Breen, Denise Stevenson, Crystal Loewen, Robyn Miller and Vi Skakum, dressed in outlandish costumes, ran around the block to warm up before plunging into the water off the end of the White Rock pier. This year’s plunge will be the 49th annual and is co-presented by the Semiahmoo, Peace Arch, Peninsula, South Surrey and White Rock Rotary Clubs, along with the Crescent Beach Royal Canadian Marine Search and Rescue unit. If you want to start your new year off with a splash and make some memories with hundreds of other community members, we’d love to see you at the "White Rock” just east of the White Rock pier this January 1st, 2019. Registration begins at 10:30 a.m., and the swim (which is free!) is at 12:00 sharp. A record-breaking number of participants braved the chilly waters on Jan 1, 2018 and watched from the shoreline to bring in the new year with a brisk start. 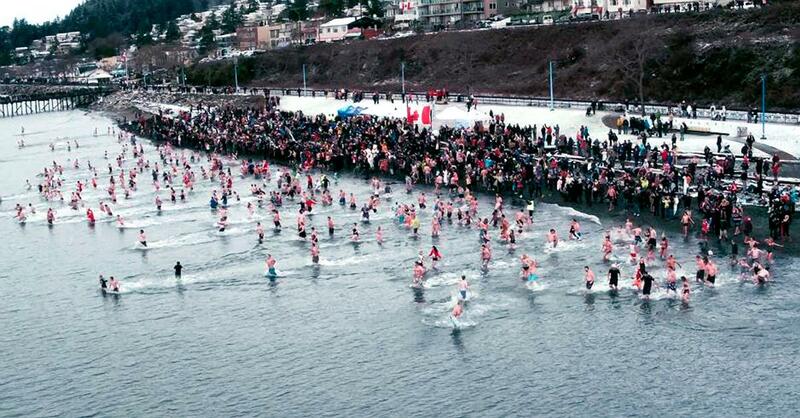 Nearly 4,000 people gathered to watch about 500 hardy revellers rush into Semiahmoo Bay for the 48th annual Polar Bear Plunge, hosted on the beach near the white rock.